Yarrow (Achillea Millefolium) is actually a member of the sunflower family, but it doesn't look it. It's a medium-tall plant made up of many, small, feathery leaves and tiny grouped flowers that have a peppery, sweet scent. Yarrow is an ancient herb with a distinguished worldwide pedigree. In the Americas, native peoples like the Iroquois, Micmac, Mohegan and Cherokee use yarrow in medicinal preparations; the Chinese art of divination, the I Ching, was traditionally cast using yarrow stems; and the herb is named for Achilles (Achillea), the almost invulnerable hero of Greek legend. Before the widespread use of hops, yarrow was used as an ingredient in beer making, and was also one of the ingredients in spells designed to ward off evil spirits. That's a lot of traction for one plant. Yarrow is hardy, drought resistant and dries well. You've probably seen it in mixed fresh flower arrangements as well as in dried wreaths and arrangements. Although the most common flower color for yarrow is probably yellow, cultivars are available these days in lots of colors from white to pink to peach to deep red. Yarrow is attractive in potpourri and has a number of interesting medicinal uses, too. 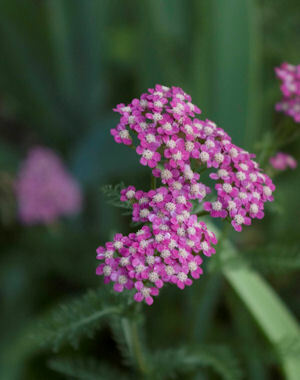 If you're looking for a new herb to add to your garden collection, consider adopting yarrow. This is a low maintenance plant that has herbal applications and makes a nice addition to the suburban landscape, too. Yarrow is a perennial (zones 3 to 9) that can reach a height of around 60 inches. It flowers in mid-summer and will keep flowering until well into fall. It's a good candidate for any sunny but neglected spot in your garden that's plagued with poor soil and dryer conditions than your pampered flowerbeds. Yarrow spreads quickly too, making it a good fill-in plant where you would usually see weeds sprouting by the end of June. Newer yarrow cultivars may be somewhat shorter and more compact. Be sure to check the informational material on the variety you have in mind. Yarrow is typically pest resistant but can be susceptible to powdery mildew. Deer don't like it much, either. Yarrow makes a nice addition to a fresh flower bouquet during the summer months. From a distance, white yarrow looks a bit like baby's breath when added to roses. White and pink yarrow are both lovely in mixed bouquets with sage, lavender and calendula, and yellow yarrow is nice in a sunflower bouquet. I like to use yarrow in wreaths and swags. This is typically a mid to late fall project and uses fresh yarrow stems that dry (with other herbs) right on the wire backing or form I'm using. You can take a look at my wreath making tutorial for more information. Dried yarrow also looks pretty added to a simple vase. The flowers retain their color indefinitely. Individual flower clusters look very nice in potpourri, too -- they're also sturdy and dense enough to retain any added essential oil for quite a long time. Tincture of yarrow also makes an effective mosquito spray. Yarrow is a natural anti-inflammatory and may have some ability to help control blood pressure. It also contains salicylic acid, a drug closely related to modern day aspirin. Historically, yarrow leaves have been used successfully in first-aid (topically) to help staunch bleeding (hemostatic). Over the years, yarrow has been known by many common names, including: carpenter's weed, wound wort, bloodwort, plumajillo (little feather), thousand leaf, soldier's woundwort, nosebleed plant and sanguinary. 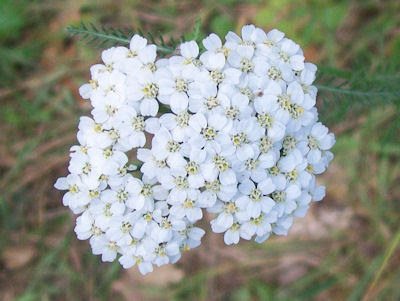 In cosmetics and personal care, yarrow is sometimes used in cleansers and shampoos, too. *Although yarrow is generally considered safe, it should not be ingested by women who are pregnant or nursing, or by people with kidney or liver problems. It is also contraindicated for individuals who are allergic to plants in the Asteraceae/Compositae family or who are taking lithium. Yarrow may interact adversely with medications that affect blood clotting, or increase or decrease stomach acid. 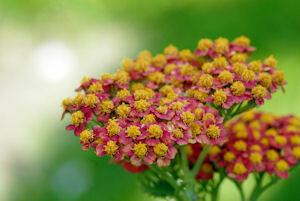 After surgery, yarrow may cause the blood to clot more slowly than normal. Ingesting yarrow can cause increased sensitivity to light. Yarrow also contains small amounts of the compound thujone, which can be toxic in large doses. Check with your doctor or other medical caregiver before making changes to your current course of medical treatment. 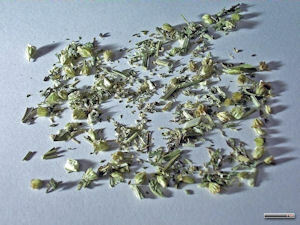 For more information about side effects and interactions associated with yarrow, visit WebMd.com (see link below). The flowers, leaves and stems of yarrow can be used to make a medicinal tea to treat mild respiratory infection and fever. It was once a popular home remedy for colds and flu. The plant can be used fresh or dried. Although yarrow tea is considered bracing, it can taste bitter. Most recipes, like the one below, include sweeteners like honey or sugar. Steep yarrow in boiling water for 10 minutes. Add lemon juice and sweetener. Stir. I haven't noticed wild white yarrow near my home in Houston TX, but nurseries carry the yellow variety (likely a hybrid). Does that have the same medicinal properties as the white?